The Minor Bantam AAA team went down to Wheeling , West Virginia this past weekend July 5 th-8th and took home the title at the Beast of the East tournament one of the largest 14u tournaments in the Northeast United States. 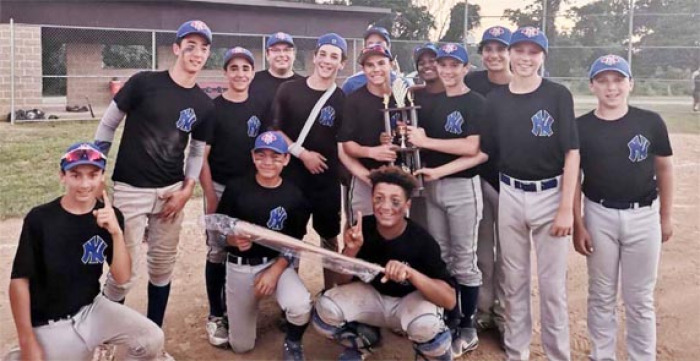 They became the first Canadian team in the 30 year history to win the 14u Title. The 28 team tournament started out great on Thursday with 2 wins over McCandless Athletic(5-2) and the Bergholz Bombers(9-2). They went on to Friday and beat Ohio Elite and Washington Wolverines 6-4 and 7-6. The Blues then moved on to Saturday and beat Moundsville 22-0 and Ohio Valley 8-3 earning a place in the semis with a perfect round robin record. On Sunday they had a re-match vs. McCandless Athletic and came up with a 5-4 win. In the Finals played the Norwin Knights a team from Pennsylvania and the only other undefeated team. The game started slowly for the Minor Bantams as they were losing 5-1 after only one inning but roared back to take the championship with an 11-9 victory to finish the tournament 8-0. Congratulations to the NY Minor Bantam AAA team on this achievement.